Somatic mutations present at a low allelic fraction have been implicated in tumor progression, recurrence, metastasis and drug resistance. The ability to detect these mutations via next-generation sequencing is crucial but often impaired by small sample size, low cellularity, and tumor heterogeneity. In order for sequencing to aid in directing personalized cancer therapies, these low-representation alleles must be accurately identified and interpreted. 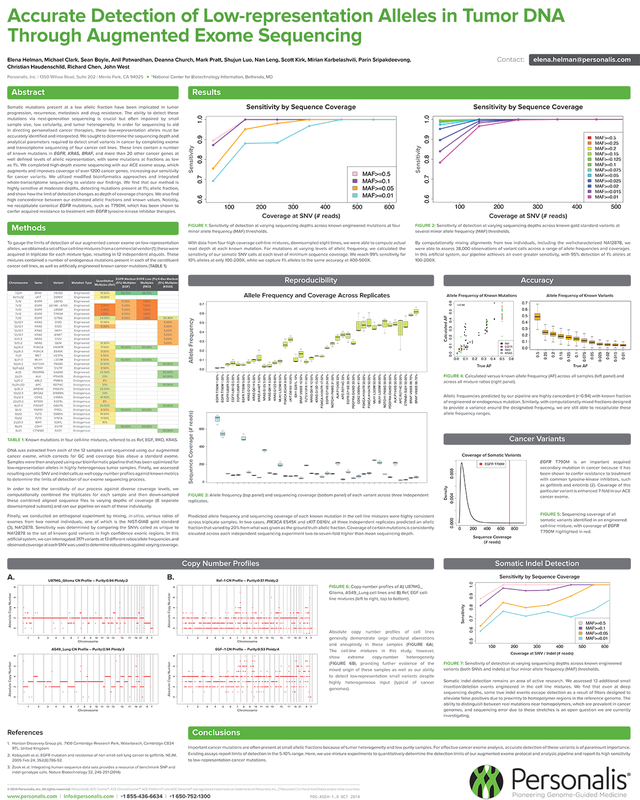 We sought to determine the sequencing depth and analytical parameters required to detect small variants in cancer by completing exome and transcriptome sequencing of four cancer cell lines. These lines contain a number of known mutations in EGFR, KRAS, BRAF, and more than 20 other cancer genes at well defined levels of allelic representation, with some mutations at fractions as low as 1%. We completed high-depth exome sequencing with our ACE exome assay, which augments and improves coverage of over 1200 cancer genes, increasing our sensitivity for cancer variants. We utilized modified bioinformatics approaches and integrated whole-transcriptome sequencing to validate our findings. We find that our method is highly sensitive at moderate depths, detecting mutations present at 1%; allelic fraction, and show how the limit of detection changes as depth of coverage changes. We also find high concordance between our estimated allelic fractions and known values. Notably, we recapitulate canonical EGFR mutations, such as T790M, which has been shown to confer acquired resistance to treatment with EGFR tyrosine-kinase inhibitor therapies.